They started July 12 at the Onondaga Nation and will end Aug. 11 in Buffalo. Part of the group of walkers head out from Breitbeck Park on their trek to Nine Mile Point. On Saturday the group of about a dozen marched from Breitbeck Park in Oswego out to the nuclear plants in Scriba. 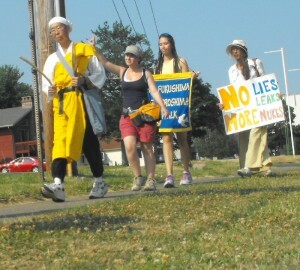 The walk is being led by long-time activist and peace walker, Jun-san Yasuda. Two of the local reactors – Nine Nile 1 and FitzPatrick – are Mark I Boiling Water Reactors, the same style as the reactors that melted down during the Fukushima nuclear disaster, she pointed out. Officials at the plants have maintained they are being operated safely and there is no danger. The peace walkers paused at the intersection of Lake Road and County Route 29 in Scriba, just outside the entrance road to the FitzPatrick nuclear plant for a vigil Saturday afternoon. Sue Matthews, one of the Occupy Oswego group, marched with the walkers “and made it all the way out there,” she said. The group also marched through the center of the Oswego Community Garden. She picked them some dinner salad greens and delivered it to St Peter’s, where the walkers were being housed for the night. Local organizations and activists are hosting the No More Fukushimas Peace Walkers as they make they way around the lake.